Ever since having a child, I’ve noticed small changes in the way I cook. For the most part, Mack eats everything that we do (sans most salt). He polished off these chili lentils, this barley risotto, and even this lentil pilaf (much to my surprise). 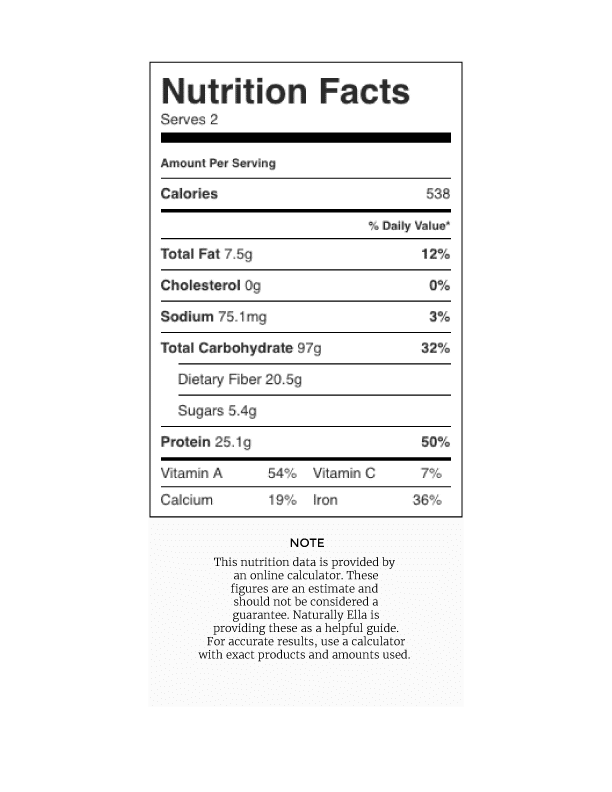 The small changes come in individual items, like mashed sweet potatoes. Mack loves sweet potatoes which results in a large quantity on hand, ready to eat. 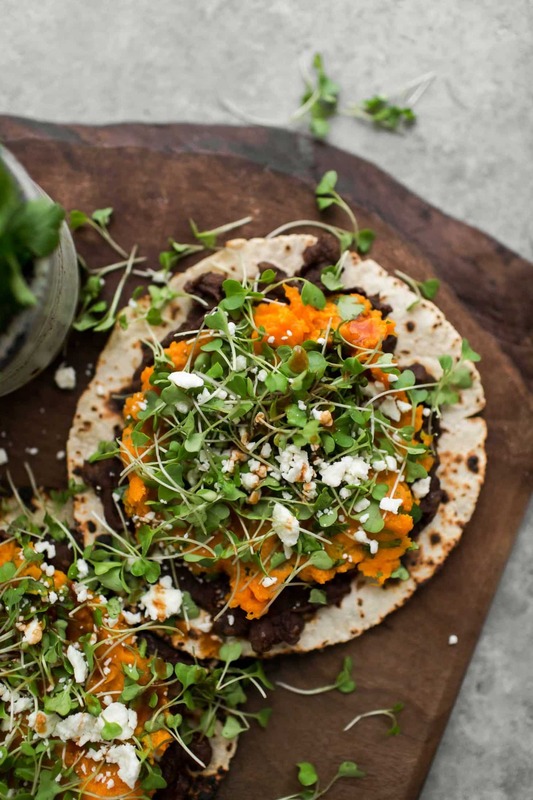 These sweet potato tostadas were born out of leftover mashed sweet potatoes. The combination with the crispy tortilla and spiced black beans makes for the perfect dinner. 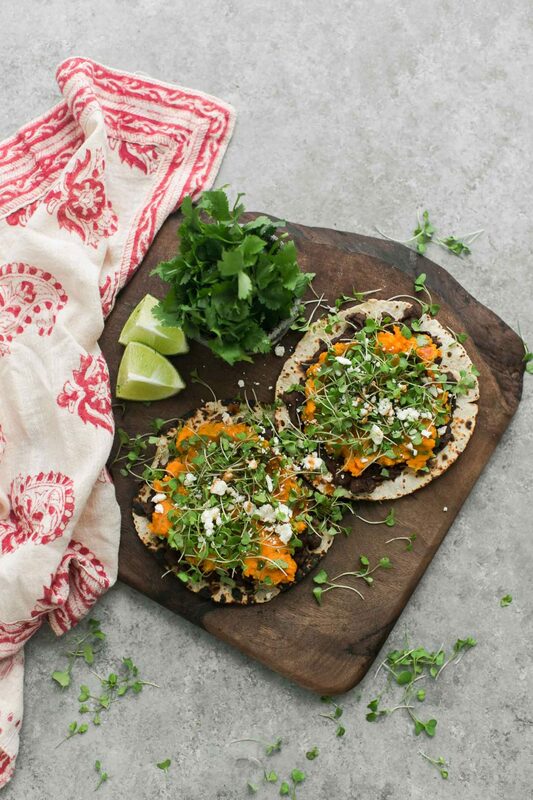 Flavorful and filling sweet potato tostadas that featured homemade refried black beans, sweet potato puree, and a fresh topping of microgreens. Place a small pot or skillet over medium-low heat. Add the olive oil followed by the minced garlic. Cook for 1 to 2 minutes, just to until the garlic begins to brown. Place beans and liquid in a pan with the cumin, coriander, garlic powder, and chili powder. Heat over medium-low heat until the majority of the liquid has been absorbed, 5 to 7 minutes. Taste and add salt as needed. Remove the beans from the heat and using a potato masher, mash the beans into a paste-like consistency. Combine the sweet potatoes with cilantro and lime juice and set aside. Place the tortillas on a sheet tray and brush with olive oil. Bake until the tortillas are crisp, roughly 10 minutes. (see note). Remove the tortillas from the oven and spread a layer of bean mixture on top followed by a layer of sweet potatoes. Top with microgreens, cheese, and a drizzle of hot sauce. Tips & Tricks: If I don’t feel like turning on my oven, I will use the gas range to char and crisp the tortilla. The result is a tortilla that’s not as crisp but still delicious. Tostadas are traditionally deep fried, so you could also go that route if desired. If the only thing you take away from this recipe is the beans, you’ve added one more key to your kitchen. These sit inbetween refried and regular black beans but the flavor is perfect for use in tacos, enchiladas, and of course these sweet potato tostadas. Vegan: This one is pretty easy: leave off the cheese! 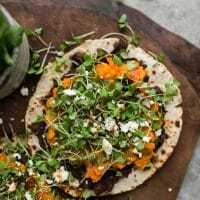 Toppings: I love having the fresh component of the microgreens but one of my other favorite fresh toppings includes making an easy spinach avocado salad with lime dressing. Squash: Really anything you could make into a puree would work in place of the sweet potatoes. My favorite alternative is pumpkin or butternut squash. Looks like feta cheese could replace the cotija cheese if cotija cheese is hard to find? This looks delicious and I can’t wait to try it! 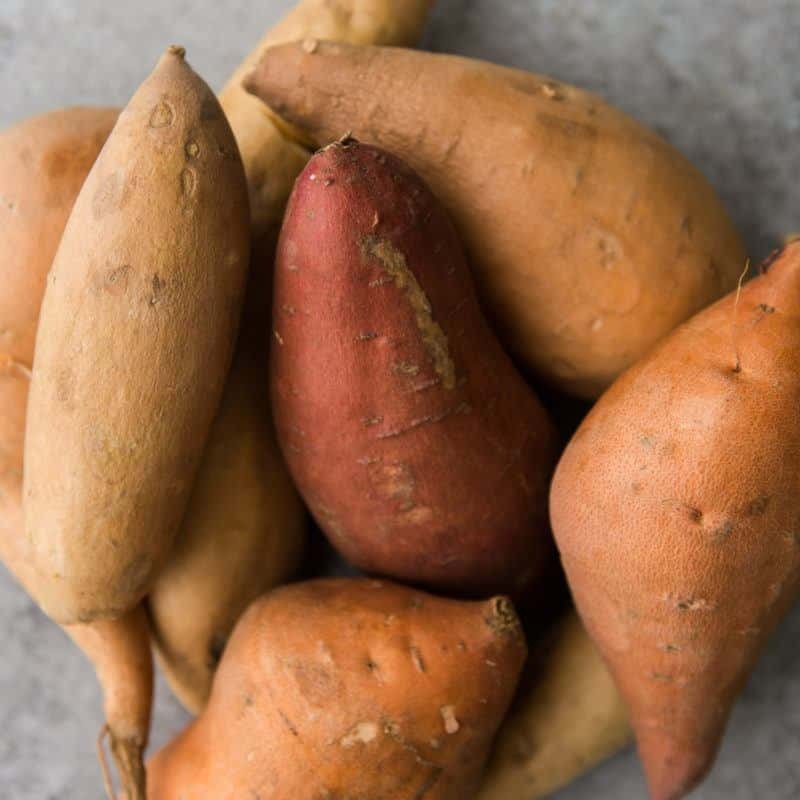 We’re still eating our sweet potato harvest from the fall and I’m always looking for new recipes. I like the feta cheese substitution idea Fernando mentioned above. Not sure I can find cotija cheese at my local market. I’m happy to have found your site, Ella, and will be sure to be back soon! WE always have leftover beans and sweet potato!! What a creative re-purposing for a fast and healthy dinner! LOVE THIS! !